A heartwarming home with a bountiful garden welcomes you to this whimsical and imaginative book of designs. Gardens can turn any patch of ground into a delightful place, so take a stroll along a beautiful stone path to admire an archway of roses. You'll enjoy hours of coloring these thirty-one detailed images. 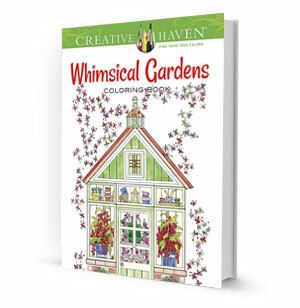 Inside the Whimsical Gardens Coloring Book, you'll see sweet little birds perched on branches; a festive garden party complete with cupcakes; vibrant floral blooms; and even a serene lily pond with cattails. The pages in this book are unbacked so you may use any media for coloring, and are perforated for easy removal. If you like the cover picture, you'll love this book! Paperback: 64 pages. Includes 31 beautifully detailed illustrations of garden delights. This delightful coloring book zestfully conveys the glories of Mother Nature. Enjoy hours of relaxation, stress relief, and mindfulness. Create your own dazzling works of art and discover the joy of coloring. Perforated pages for easy removal and display.